For reasons scientists don't yet understand, the population of Rose-ringed Parakeets in Britain has increased from 1,500 in 1995 to an estimated 30,000 in recent years. The Rose-ringed Parakeet, native to the Indian subcontinent and sub-Saharan Africa, did not fly to London from those far-off places. Rather, it is widely assumed they either escaped from their British owners or were intentionally released. What is confounding experts is the population explosion in these birds over the last decade. Where they were once considered exotic rarities, these days the parakeets are viewed as pests and a potential threat to crops. The planting of exotic ornamental plants provides imported food to the parakeets. An increasing number of British residents have set up bird feeders and keep them filled with seed. A slightly warmer climate has caused the bird's metabolism to increase during breeding season. The warmer climate has increased the growth of a favorite food of the parakeets and/or has killed off a predator. Rose-ringed parakeets are stunning exotic birds. It's unfortunate they are developing a reputation as a nuisance in Britain due to overpopulation. Hopefully experts will be able to determine why these birds are reproducing at such a high rate and take humane steps to control the population. Feral Rose-ringed Parakeet populations can be found in India, several cities throughout Europe, Tehran, Iran, and in the U.S. in Florida, California and Hawaii. In contrast to the overpopulation problem around south London, Berkshire and Surrey, in some parts of South Asia where the birds originated, the population has dropped dramatically due to trapping for the pet trade. For those of you who might not know, a parakeet is actually a small to medium sized species of parrot that usually has long tail feathers. 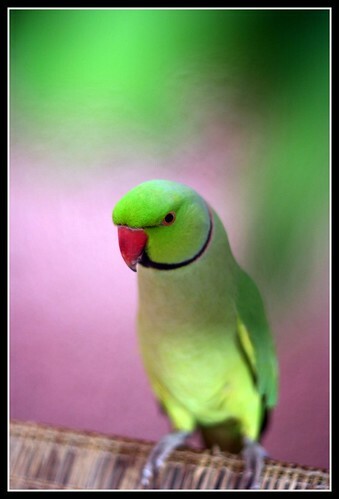 The Rose-ringed Parakeet is also known as the Ringneck Parakeet and its species is Psittacula krameri. This species of parakeet is distinguished by a colored collar or ring around the neck of the males, or a stripe across the chin. The Asian subspecies are the Indian Ringneck Parakeet and the Boreal or Neumann’s Ringneck Parakeet. The African subspecies are the African Ringneck Parakeet and the Abyssinian Ringneck Parakeet. The male Indian Ringneck Parakeet is typically green in color, with a lighter color abdomen and a blue tint to the back of the head. There is a black ring running through the chin and along the cheek, which blends with a pink collar around the neck that has some blue at the nape. The central feathers are blue with yellow-green tips; the outer tail feathers are green. The upper part of the beak is a reddish color and the lower part is black. Female and young male Indian Ringnecks have no black ring or pink collar, nor do they have a blue tint on the back of the head. Young birds get their adult plumage at about 3 years of age after their second full molt. Indian Ringnecks are typically 16" long as adults. The African Ringneck Parakeet is close in color to the Indian Ringneck, but the colors on the face and collar are less vivid. The beak is smaller, and so is the body. However, the tail is longer than the Indian Ringneck, so the African Ringneck is actually longer when full grown at 17". In captivity, many mutations of the Rose-ringed Parakeet have been bred, including the common green, blue, grey and lutino, as well as other colors. The Rose-ringed Parakeet is a non-migrating bird and one of a few parrot species that can live in disturbed habitats. This means they can adapt to a changing environment brought on by, for example, urbanization and deforestation. These parakeets are noisy, with a distinct squawking call. In the wild they primarily eat berries, nuts, seeds, fruits and vegetables. They are also known to fly distances to forage in agricultural areas, ravaging crops. The average lifespan of a Rose-ringed Parakeet is 25 to 30 years, though there are documented cases of birds that have lived past the age of 50. Rose-ringed parakeets are very popular as pet birds. As with any exotic bird, however, it's very important for a prospective owner to understand the high-maintenance nature of this type of companion. If you're interested in acquiring a Ringneck as a pet and are prepared to make a substantial and lifelong commitment to it, I recommend you contact your local animal shelter and/or exotic bird sanctuaries in your area. The latter, in particular, are often overwhelmed with beautiful, wonderful abandoned and rescued birds in need of new homes. I do not recommend buying birds from anyone that can't produce proof of where the bird came from (this is important to stop the illegal importation and smuggling of exotic birds). Both sexes of Rose-ringed Parakeets can mimic human speech. They adapt easily to life with human caretakers and even appear to show human-type emotions when they are kept as pets. Hand-fed Ringnecks provided with daily attention become family pets rather than picking a favorite human in the household to bond with. They are resilient birds, and while they often don't require the intense amount of human interaction other parakeets their size require, they do need daily human attention in order to remain tame and thrive in captivity. Like most parrots, they are extremely smart and easily bored. Training, socializing and guiding the behavior of your Rose-ringed Parakeet from a young age will help prevent him from acquiring habits like destructive chewing, aggressiveness, or becoming jealous of other pets or people in the family. Ringnecks are especially prone to a 'bluffing' period which comes on very suddenly, usually when a bird is between 4 and 12 months of age. It is assumed the bluffing stage of development is brought on by hormonal changes as the parakeet grows toward adulthood. It's important not to withdraw from your bird if she enters a bluffing period. The best approach is to ignore the behavior and continue to socialize and handle her daily. Leaving her confined or avoiding her will only increase her antisocial behavior. Hang in there, remain patient and try not to take the behavior personally. Bluffing behavior typically lasts from a few weeks to a few months. Another habit you'll want to manage is your bird's noise level. There are ways to curb excessive screaming and shrieking, one of which is to encourage your parakeet's ability to whistle and talk instead. In fact, these birds are considered one of the best talking species of parakeets and can be taught a vocabulary of up to 250 words. Feed your Ringneck a nutritionally balanced organic pelleted diet. Add an appropriate variety of fruits, veggies and nuts as treats. As with all birds, fresh clean drinking water should be provided to your pet at all times. I also recommend a small amount of coconut oil be added to your pet bird's diet everyday to keep plumage bright and shiny. Rose-ringed Parakeets need large cages to accommodate their long tails. Your bird's cage should be at least twice the size he is with outstretched wings. I recommend you buy the biggest cage you can afford and outfit it with plenty of natural wood perches. The cage should be located in a low stress but social area of your house. Sunlight is important for your Ringneck's emotional, mental and nutritional wellbeing. The correct spectrum of ultraviolet (UV) light birds require for health is filtered out by window glass and screens. I recommend providing your bird access to UV light via a special UV "bird bulb" over his cage for several hours a day. Ringnecks like to chew and climb, so your cage should have a roof perch, lots of toys and ropes for chewing, bells, colored blocks, etc. Make it a habit to replace toys frequently to keep your bird interested in his habitat. Clean your bird's cage daily, and replace newspaper liner daily as well. All loose material (feathers, leftover feed, bird poop) should be carefully disposed of before disinfecting cage surfaces. Remove your bird from the area during the disinfecting process. Make sure to pick a non-toxic, bird friendly disinfectant. I use diluted vinegar on my bird cages and stands. Next Article A Gentler, Kinder Way to Say Goodbye -- Is it Right for Your Pet?